Browning's Crossfire flashlight gives you the brightness and distance of a 2-CR123 lithium battery flashlight, but it does it using only two standard AA batteries for a lifetime of economical operation. Housed in a rugged, lightweight polymer body with unbreakable LED, the Crossfire pushes a bright white beam out to 135 meters. Browning &apos;s Crossfire flashlight gives you the brightness and distance of a 2-CR123 lithium battery flashlight, but it does it using only two standard AA batteries for a lifetime of economical operation. Housed in a rugged, lightweight polymer body with unbreakable LED, the Crossfire pushes a bright white beam out to 135 meters. 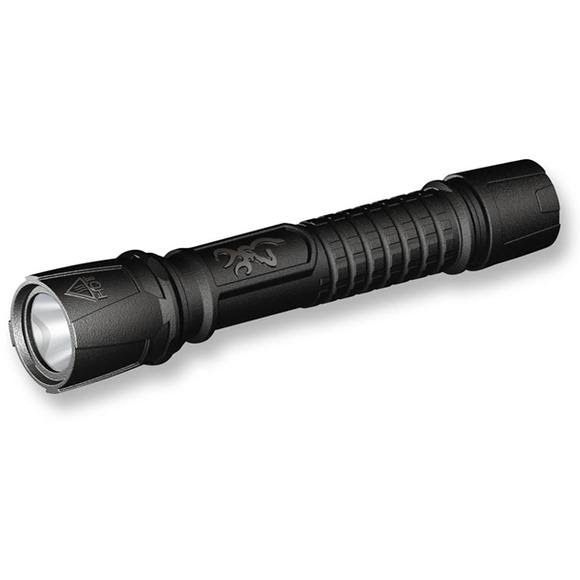 On the High setting it punches out 125 lumens, and on the low setting at 10 lumens the Crossfire will run for 24 hours. The lock-out tail cap switch keeps light from turning on accidently. Small, tough, very powerful and economical to use, the Crossfire is O-ring sealed for water-resistance.